Being a regular drinker of Maker's Mark whenever I'm out and the selection is limited, I figured I owed a post devoted to Maker's 46, the big brother to standard Maker's Mark. As you may have noticed, Maker's has begun a large ad campaign for Maker's 46, with commercials showing the charred oak staves being placed into the barrel in rows before the barrel is re-sealed. Certainly it's something a little different, and given my enjoyment of Maker's Mark productions (especially their cask strength bottling), it would seem to follow that Maker's 46 would be somewhere in my wheelhouse. 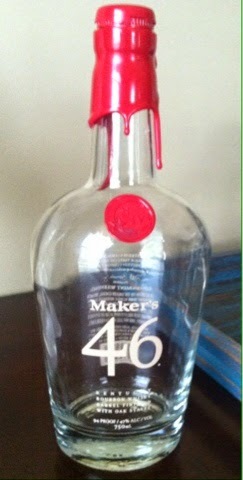 As expected, Maker's 46 carries the same flavor profile as regular Maker's Mark, only different. And by "different" I mean that it has more body and more complexity to it. I enjoyed the nose a lot. It is sweet with a strong caramel scent, but it also has a hint of spice that made me salivate a bit at the anticipation of taking my first sip. As noted, the flavor carries the familiar profile of Maker's Mark products. It is strong in vanilla and toffee flavors, with that light spice/tang (I can't quite put my finger on it) typical of wheaters. What really stands out in this bourbon, though, is the smokiness on its finish, something I really enjoyed in this one! It would make sense, considering their commercials, that the extra char from the additional oak staves would supply this additional smokey flavor. After having the bottle open a while, the bourbon really took on a smokey vanilla flavor, again a flavor that I found particularly enjoyable (and perhaps smoked vanilla extract is a real thing that actually exists -- I may need to do some searching on the internet). Overall, I enjoyed this as a somewhat more complex version of Maker's Mark. It wasn't over-the-top exceptional, but for a bourbon that is readily available and not excessively priced, I wouldn't hesitate to grab a bottle off the shelf in the future if the mood so suited me. I found I went through this bottle pretty quickly, which is always a good indicator.